It looks like artichoke season is starting and you see them come out on the shelves, one of the largest producer being close to the Bay Area in Castroville (they claim to be the artichoke capital of the world, which is quite a big statement, but they certainly do produce a lot of them), we have in San Francisco, lots of beautiful artichokes, the babies, the medium, the large, you pick which one you want. I even planted some in the garden, but seems like it takes over 300 days for them to grow, so I cannot count on my own crops this year! I had some fresh chick peas left from last week and I just wanted to use them in a tagine. They remain green and taste so good but cook very quickly so when using them in a dish, they only need to cook for 15 minutes or so, therefore add them at the end. I love tagines, I could eat them every day. The flavors of all the spices infusing with all those wonderful vegetables is a pure pleasure to cook (and to eat of course too). After 10 minutes of placing the tagine in the oven, the house starts to be filled with incredibly aromas. It’s like a pure perfume. Ca embaume. The composition of Ras el hanout can vary from 24 to 21 spices but can go as far as 40 spices, so there are so many variations of Ras el hanout as there are cooks, manufacturers and tastes. I bought a big bag of spices in a Moroccan grocery store in France that will last me my lifetime, and that is a very nice blend, not one spice overpowering the mix, and a very well balanced combination. Unfortunately the manufacturer did not include the list of the spices he used, so I am afraid I won’t be able to know what has been used and to what quantity. In France we have a huge Arabic population, probably the biggest among all other European countries, which means a lot of stores with great products and very inexpensive. 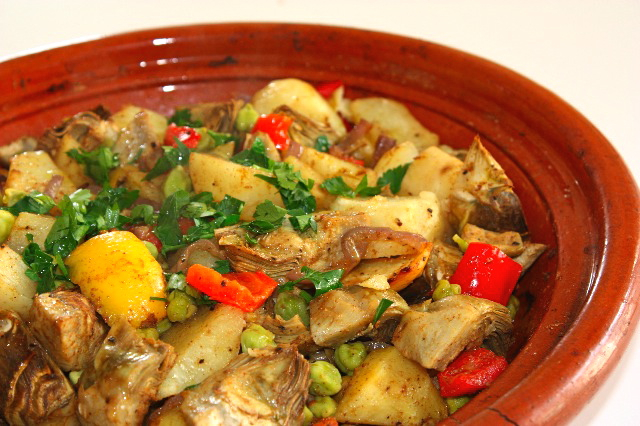 Anyone who loves artichokes and spices, will really enjoy this dish, besides the beauty of tagines is that it might take you a while to clean the artichokes, and peel the potatoes, but then you just put it in the oven and cooks by itself, comme une grande fille! In a large mixing bowl, combine all ingredients together except for the chick peas and using your hands mix well. Place the vegetables in your tagine pot, cover and cook in a pre-heated oven at 390F for about one 1h30 min. Add chick peas 20 minutes before removing tagine from the oven. Sprinkle with cilantro and serve as a side dish or as a main dish, with a quinoa or couscous accompaniment. This entry was posted by silvia on March 8, 2010 at 8:03 am, and is filed under Side Dish, Vegan, Vegetables. Follow any responses to this post through RSS 2.0.You can leave a response or trackback from your own site. Silvie, I am in, now if I can find the Ras el hanout! Silvie, did I miss the quantity of chick peas? I just ordered my Moroccan spices……..
i wish to know the taste of your tajine…but here i don’t have a lot of ingredients.i think is full of flavours! Now I need to watch for Ras el hanout. There is just so much to investigate in the foodie world. Well, I can find ras el hanout but I think you told me that some have too much cinnamon? I will have to smell before I buy! I agree, this is the kind of thing I could eat every day as well. (Well, that and a Sveltesse!) So lucky that you have all those nice artichokes now. I have never cooked artichokes before. I always think as too much work for very little. Fresh Chickpeas will be a long wait in this neck of the world – but my daughter is in Palo Alto – so we will get to them, eventually. I would love to try them Artichokes in the south of SF area are THE BEST… and your site is a treasure trove of innovative ideas. I am IN! Incorporating Indian spices and potatoes makes this is a wonderful recipe for spring as we ease our way into warmer weather. I used to love the smell of the artichoke fields as we drove through Castroville. This dish looks yummy, I would like to try it.